Judging by the photos these Danish Modern Small Terrariums at Popdeluxe.net look pretty neat! I can't identify all the plants but the arrangement follows a more natural look- which I personally prefer in terrariums. Regardless of the plants I do love the container- the wooden handle would look great with your Danish Modern living room set! They have a large one as well. $129. Very Nice I like the container too! I love the glass container as well - the wood handle is just lovely. However, I don't like ferns too much so I would've preferred soft grass and moss or pretty little flowers. 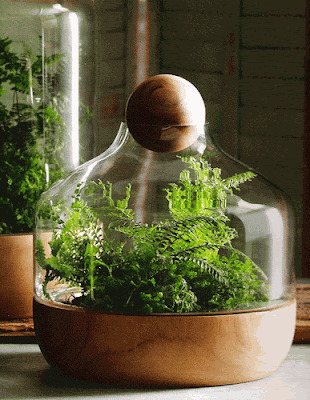 But it's a fabulous terrarium nonetheless. What an amazing terrarium, I love it! Thanks for stopping by my blog. Perfect timing since I am in the middle of terrarium week. Glad I found your blog. Hvad er et "dansk Terrariet"? Det er ikke noget vi kender hende i Danmark! Tror det må VAERE et Amerikansk trick, at kalde det "Dansk", sa sælger det nok bedre.